The Globe and Mail newspaper recently asked Leon Frazer and other select investment professionals to recommend a stock to own for the next 100 years. We picked Enbridge, a name Leon Frazer has held in our portfolios for over half a century. A good investment is one that stands the test of time. To pick a stock for 100 years requires an assessment going way beyond the themes and trends that are topical today; it requires a view to the future in which our children’s children will be living. Businesses that provide “infrastructure” solutions. The beauty of an infrastructure asset is that once it is in place, it is very difficult for a competitor to displace. Whether a pipeline, a rail line, a telephone/cable line, or even an ATM network, once an infrastructure asset is in operation, its cost advantages can be a large barrier to entry. Businesses that convert the cash generated from an asset into a dividend return. Over time, many of the best dividend payers have in fact been the companies with the best infrastructure businesses. Leon Frazer’s time-proven strategy of owning a portfolio of companies that pay growing dividends enables us to provide the investment returns our clients seek to satisfy their future needs. At a time when standards of living are being stretched by rising prices and stagnating income, finding companies that can grow their payouts to shareholders is more important than ever. Enbridge has the lowest cost of capital of any company in the fuel transportation business. Enbridge has a corporate culture which focuses on returning investor money year-after-year. We call this the discipline of paying dividends. Note there is no mention of current management; over a period of time when senior management will change at least half-a-dozen times, the culture of returning monies to shareholders is more important than the people currently in place. The importance of dividends in creating shareholder wealth is best shown in the chart. Over the past quarter century, the stock price of Enbridge, adjusted for splits, has gone from $1.81 to $32.47, an increase of 17.8 times, or an annual return of 10.9%. 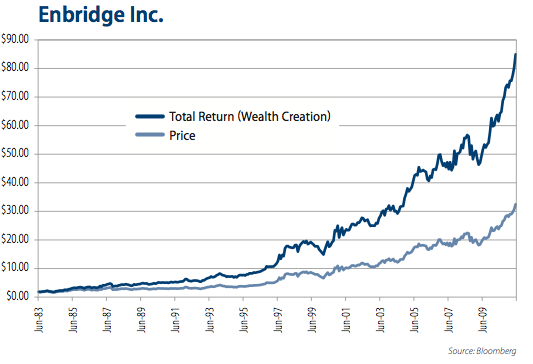 When Enbridge dividends are reinvested, the wealth created by Enbridge goes from $32.47 to $84.94, or an annual return of 14.6%. By comparison, consider Goldcorp, a more cyclical mining stock, which saw its price go from $1.80 to $48.46, an annual price return of 12.3%. Despite being up more in price, because of its limited dividend history, the wealth creation from Goldcorp only went to $52.46, or an annual return of 12.7%. Stock price appreciation is only part of the wealth creation story. In today’s world of instant news, we believe too much attention is focused on near-term price moves. When building portfolios for our clients, it is investments like Enbridge that allow us to spend time thinking of where our clients’ assets will be in 10 to 20 years, not in 10 to 20 months.